The Grover Cleveland Birthplace Memorial Association and The Montclair Orchestra are pleased to invite the public to an interactive and opulent ball celebrating the 1883 Inauguration of President Grover Cleveland at the Upper Montclair Women's Club in Montclair, New Jersey on Saturday, November 10th, 2018 at 6:30pm. Montclair, NJ, September 14, 2018 — The Grover Cleveland Birthplace Memorial Association and The Montclair Orchestra are pleased to invite the public to an interactive and opulent ball celebrating the 1883 Inauguration of President Grover Cleveland at the Upper Montclair Women's Club in Montclair, New Jersey on Saturday, November 10th, 2018 at 6:30pm. Designed to be an immersive experience, the black-tie affair pays tribute to the life and accomplishments of New Jersey’s only native-born President, Grover Cleveland. All money raised will go to increase awareness of Cleveland's birthplace located in Caldwell, New Jersey and his historical significance. Playing the President during the reenactment of the inauguration will be his grandson, George Cleveland and playing Vice President Adlai Stevenson, will be his great grandson, US Ambassador Thomas Robertson IV. John Elliott of CBS Morning News along with former White House pastry chef to five presidents, Chef Roland Mesnier will serve as Masters of Ceremonies. Mesnier’s appearance will include a book signing, the sharing of humorous stories about his life and time in our nation's presidential residence. 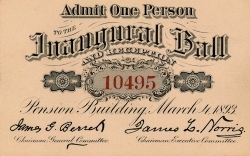 To relive the romance of the late 19th Century, guests may purchase tickets for $300 per person and $500 for Patrons, who will receive a copy of Chef Mesnier’s book and preferred ballroom seating. Sponsorship opportunities are also available and all proceeds benefit the Grover Cleveland Birthplace. To purchase tickets or for more information, visit www.presidentcleveland.org or contact 973-226-0001. The Montclair Orchestra is a unique training orchestra that offers fellowship playing positions to students from some of the most recognizable music schools in the world, including The Juilliard School, Cali School of Music, Mannes School of Music, Manhattan School of Music, and Mason-Gross School for the Arts. Playing alongside the student fellows are professional 'mentors', including some of the world's best orchestral musicians. Players from the Metropolitan Opera Orchestra, New York Philharmonic, New Jersey Symphony Orchestra, Orpheus Chamber Orchestra, Orchestra of St Luke's, and other NYC-area orchestras play alongside the student fellows for an unforgettable experience for both musicians and audience. Leading the orchestra in its second season is Music Director David Chan, the concertmaster for the prestigious Metropolitan Opera Orchestra.